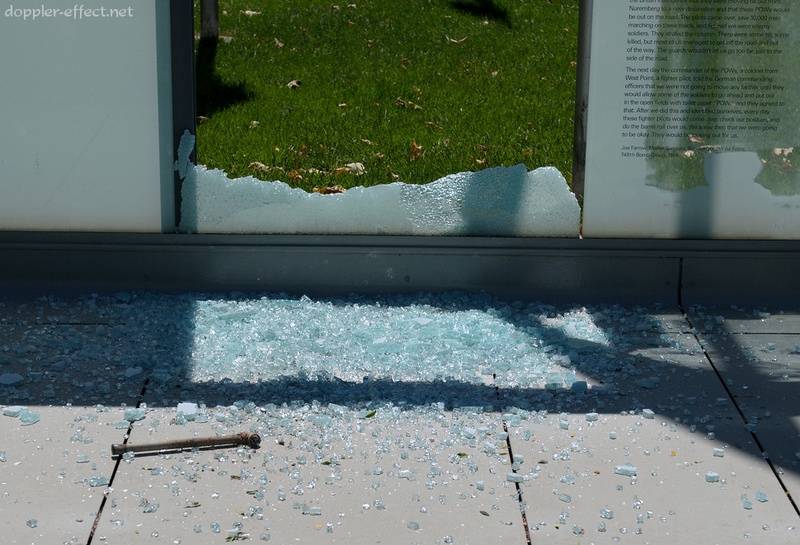 In what was likely an act of vandalism, a glass wall in the San Jose Veteran's Memorial appears with a shattered pane of glass, as photographed last Tuesday, May 11th shortly after noon. A short metal pipe lies on the ground amidst the broken glass. This would not be the first time the Memorial was vandalized. In April 2005, the San Jose Police Officers' Association established the Victims' Assistance Program as a "community fund to assist victims of violent crimes or loss of property," according to the Program's website. The inaugural donation, in the amount of $5,000, was made toward the repair of an estimated $20,000-worth of damage to the Memorial from an act of vandalism which was discovered in March of that same year. The Veterans Memorial consists of 76 flags on 30 ft. steel poles, representative of military personnel in formation. They also reflect the tiers of white headstones in a military cemetery. The white flags represent the anonymity of each who serves -- white is a sign of peace. The snapping fabric in the winds, contrasted with the serene canopy of white banners, reflects the military strength which preserves our peace. 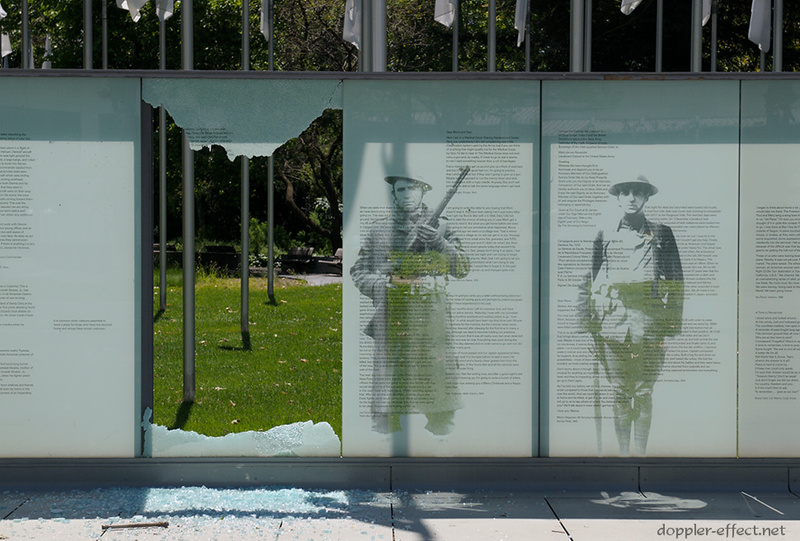 The now-defunct Manhattan Projects architectural firm designed the memorial, and the glass wall was constructed by John Lewis Glass, an Oakland-based glass studio founded in 1969 by UC Berkeley alum John Lewis. The Memorial was dedicated on November 11, Veterans Day, of 1997.